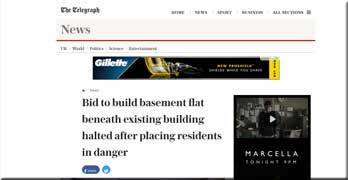 A plan to build a basement flat at the bottom of an expensive central London block features in the Daily Telegraph today. Forty five residents at Queen Court in Bloomsbury are furious at the proposals to transform the 1,975 square foot space with no natural light, apart from a few skylights, into a basement apartment. The residents, who have an RTM, have successfully obtained an injunction to stop the work after discovering that they breached safety regulations and may have invalidated the building’s £15 million insurance policy, the Telegraph reports. The newspaper also revealed that the owners of the basement are John Emore, 56, who runs an office rental company and his wife Florence, 48, a doctor at a London hospital. However, the basement came with existing planning consent from Camden Council to develop a one-bedroom flat, and this had been granted in spite of previous objections. The case indicates the feverish state of the London property market. Average property prices in the area are £768,669. Curiously, Queen Court was once home to the heroic British secret agent Tommy Yeo-Thomas GC, known as the White Rabbit, who was captured in Nazi occupied France, tortured and subsequently imprisoned along with other British agents at Buchenwald concentration camp. 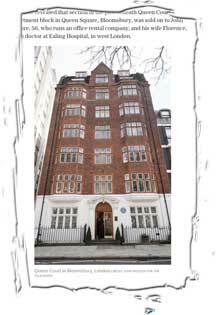 His widow – although they were never formally married – lived in a small flat near the Sanderson Hotel, north of Oxford Circus, where the founder of this website interviewed her for the Daily Telegraph in 1996. The Right To Manage Federation chalks up its 28th leasehold RTM success in central London … as it fights epic Plymouth RTM duel in the Land Tribunal Metcalfe Court: how a retirement site has benefited from RTM BBC Radio 4 on housing association leasehold … and a German asks: is it safe to buy a flat in London? No.1 Deansgate wins epic RTM battle, as freeholder throws in the towel at the Court of Appeal Should the RTMF be taking the Elim Court battle for right to manage to the Court of Appeal? Quite shocked to read this, I am familiar with the building and always admired how well maintained it looked. The costs for the injunction were £40000+ what happens to buildings whose residents are not able to pool together that sort of money? This case raises many questions. The boiler room and electrical intake room are common parts surely? How can they be sold to someone else? The leaseholders must feel that their nightmare in Wonderland has just begun. Agrre with Nigel. With what is in the basement why did the council give planning permission. If thr work todate is nreaking various regulations why did the freeholder not step in. The freeholder sold the ‘unexcavated basement space’ (‘most of the footprint’) on a 999 year lease to someone for £150,000 who divided it up and sold a quarter share (including the plant space that has planning permission for a 1 bedroom flat) to Mr and Mrs Emore for £350,000 (according to The Telegraph). That’s probably why the freeholder is lying low. Perhaps the hearing on 28th April will sort it all out but my guess is it will take longer than that.